In my first blog about Pathfinder back in June I introduced this new offering to you, outlining that Pathfinder is the ideal starting point to identify innovations and optimization potential for SAP ERP. A lot has happened in the last few months and today I would like to give you an update. In just 4 months we already delivered over 200 Pathfinder reports to customers! Pathfinder helps to open a discussion where customers focus on upcoming innovation activities from a line of business and IT perspective. 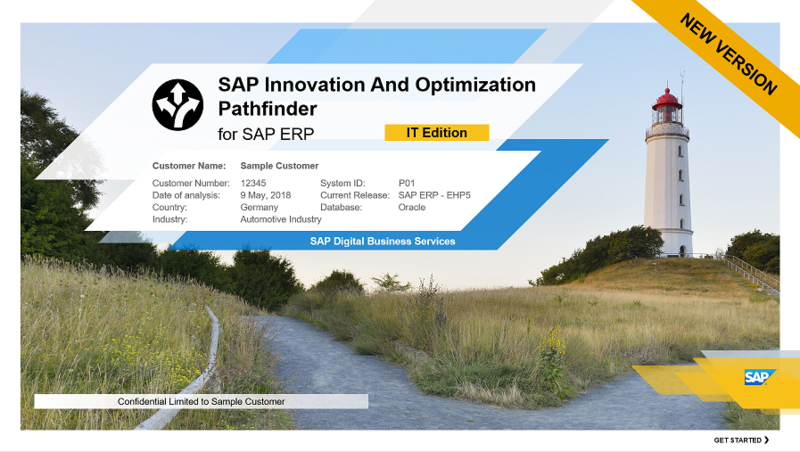 Pathfinder identifies SAP innovations that are relevant for a specific customer’s ERP system, offering tailor-made recommendations for innovations and optimizations. For example, out of hundreds of SAP Fiori apps, Pathfinder can recommend the 20 apps which are most relevant for the sourcing & procurement line of business. This report is FREE for all SAP customers under SAP maintenance. It is delivered by SAP Digital Business Services within five working days. Pathfinder provides specific, quantified insights and prioritized decision making through industry benchmarks. We implemented many usability improvements based on customer feedback and SAPPHIRE usability tests, now readability is much better and report navigation easier. Many additional business and IT scenarios added (e.g. new content about custom code). Pathfinder is now available also for partners (VAR-delivered Support). Improved process to activate enhanced SAP EarlyWatch Alert. Going forward customers have the option to choose “express option” which allows a more easy and faster creation of enhanced SAP EarlyWatch Alert report (please make sure to check additional prerequisites). We updated the How-To guide and created a small video to explain to you those optional improvements. Take a moment to watch this video and find out about Pathfinder. Visit the Pathfinder landing page for videos, how to guide, and a sample report. Activate the enhanced SAP EarlyWatch Alert – allow some time for preparation of the activation. Although actual efforts should be only a few minutes, there is some waiting time involved in the standard activation process. With the new “Express Option” this can be accelerated. Submit the data to order your Pathfinder.